When we first acquired the land, we had to decide where to put the automatic waterer for the horses. We decided to place it deep into the woods in order to provide protection from the elements. I found a spot that seemed appropriate and our wonderful contractors dug up the soil and installed the automatic waterer. When the miniature horses arrived, it took a few days for the plumber and electrician to set up this waterer. On the day that they completed it and the minis could actually drink from the waterer, I came home to check out our new “make life easier” gadget. 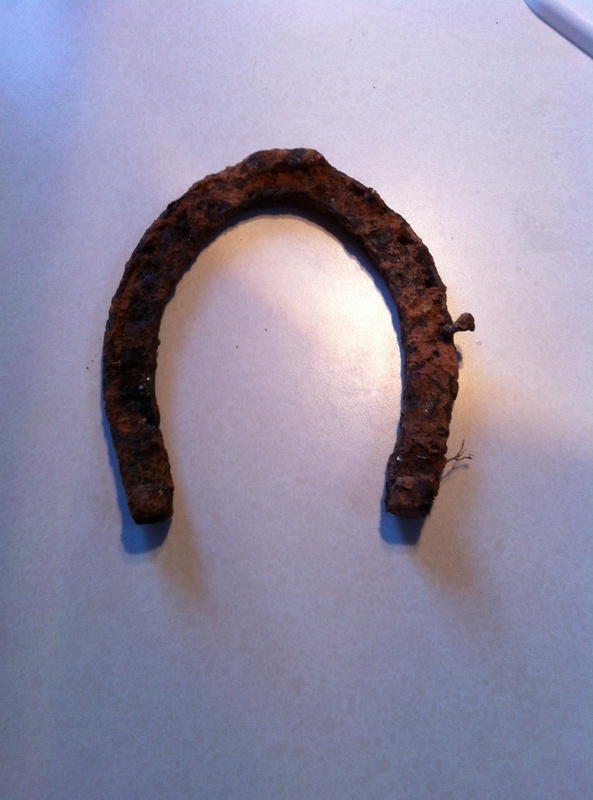 Right next to the waterer, I found this horseshoe that our farrier, Ron, believes is from a work horse that may have been in those woods over 100 years ago. I guess that our newly found horseshoe has to be placed at the entrance of Serene View Ranch.